Wonder Woman 24-25’s ‘A Star in the Heavens’ comes at us like a breather, a lightweight two-parter in between the meaty action of the preceding ‘Ends of the Earth’ fantasy worlds storyline and the upcoming, much-hyped ‘Rise of the Olympian’ multi-parter. After all, the hero in Hollywood bit has been done many times previously, with shallow LA types failing to ‘get’ a character, or just plain disregarding the truth in a bid to make a buck. That’s the basic set-up here, with the unique selling point being the inclusion of Tsaritsa, Queen of Fables, writer Gail Simone’s wicked stepmother of all fairy tales. She uses the movie as a springboard from which to attack Wonder Woman, whom she believes to be her nemesis, Snow White. Diana duly triumphs – no great surprise there – but she does it with such confidence and smarts that this issue is a delight from start to finish. The internal monologue positions us with Wonder Woman as she figures out what’s up, and how to tackle the mad monarch. Her dialogue with the Queen shows us Diana’s personality – confident and cocky, without being arrogant. And happily, the Queen’s reality-bending abilities make it reasonable that while she’s up for the challenge, Diana doesn’t take it for granted that an easy win is in the offing. Thus, arena battles with armoured, axe-wielding centaurs and the morphing Queen herself have enough tension to carry the story forward. These follow a tussle with the ‘storybook’ versions of Diana who appeared at the close of last issue, including, appropriately enough, the Cathy Lee Crosby TV movie Wonder Woman (sadly sans mule). That’s a lot of action for one issue, but the conflict always conveys character, and that’s comics gold. The main story ends with a great scene involving the screenwriter, Diana’s Gorilla City associates and a pair of Aviators that’s one of my favourite Wonder Woman moments ever. After that we get a coda that’s excellent in a different way, a moment of quiet drama that sees Diana visit Allison Condera, the Hollywood counsel introduced last issue who was surprisingly hostile to Diana. As I suggested in my thoughts on that book (http://dangermart.blogspot.com/2008/09/wonder-woman-24-review.html – shameless bid for traffic), she’s neither a post-Amazons Attack memory-wiped Themysciran nor anyone else from Diana’s back catalogue of friends and foes. Nope, she’s just an ordinary. hard-working single mom who’s resentful of the hero worship her daughters reserve for Diana. A very human response to a larger than life figure. She’s also an alcoholic, something Diana intuited, but Allison is on the wagon. Diana and Allison make peace and the story ends with Super-Heroine Number One meeting two very lucky girls, and a subsequently broody Diana (tying in with last month’s scene in which Hippolyta urged Diana’s love interest/victim Nemesis to provide her with grandchildren). I loved the Allison vignette to bits, as it was pure Marston Diana, with Amazon interacting with the ordinary woman, and making a friend of an antagonist. The perfect capper to a splendidly realised two-parter which sees Simone continue to redefine Diana. The heroine’s voice is slightly more relaxed from the occasionally starchy narrator of recent months, while still recognisably the same woman. And while not your actual big arc, as I said at the top, this two-parter advanced continuing plotlines and themes while providing a big old fun ride for heroine and reader alike. A big part of the success of this issue is Bernard Chang, who earns his place as the great Aaron Lopresti’s pinch hitter via vibrant layouts and delightful character work. A nod, also, to colourist Kanila Tripp, a new name to me. She takes full advantage of the fantasy backgrounds to give us yellow skies on Movie Paradise Island, green skies above the arena and more realistic hues in the real world sequence. She also paints the people pretty! A few questions and comments – what’s the back story on Allison’s wee girls being of different racial mixes? OK, they could have differing dads, but they look the same age. And I can’t see Simone (apparently) setting something up without a pay-off planned in good time. The Movie Amazons biggest reason for their hatred of men was hilarious (‘…They leave the toilet seats up!’). The sort-of return of Wonder Tot was just brilliant, and Chang channelled Silver Age artists Ross Andru and Mike Esposito superbly. Diana notes that she never really got along with centaurs, which means that her Wonderdome/dumb era advisor Chiron was either an aberration or – please! – has been retconned away. I loved Chang’s very occasional use of page borders to add to a scene’s mood – at once intelligent and attractive. 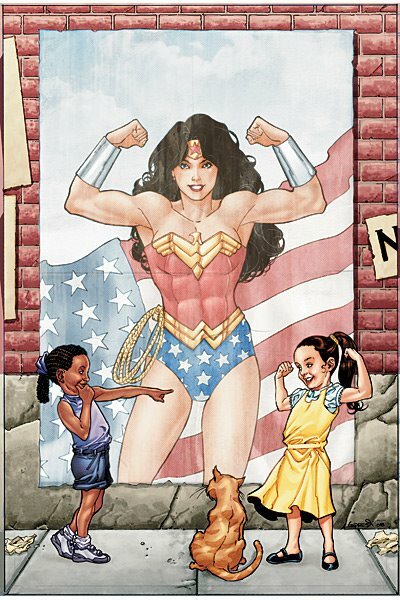 The metatextual comment by Diana on the possibility of a good Wonder Woman film was a cute wink at the never-ending real-life ‘will there be a Wonder Woman movie? saga. Lopresti’s cover is an instant classic – sweet, evocative and cleverly executed, with the DC Comics indicia’s incorporation. All in all, Wonder Woman 24-25 comprise two of the most delightful entertainment experiences I’ve had in quite a while. Who needs movies?